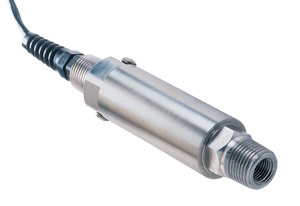 OMEGA’s PX41 Series consists of high-accuracy, low-cost pressure transmitters. Their sealed, all stainless steel construction makes them suitable for the harshest environments. They are available in gauge, absolute, or sealed gauge models. Three metres of PVC insulated screened cable is standard, or a Bendix style connector is also available. A wide selection of amplified voltage and current outputs makes the PX41 a truly versatile family of industrial transmitters. FM Hazardous Location: S/I/1/ABCD optional. Available on absolute pressure and sealed gauge units with cable termination. Must be specified at time of order. MSHA: Mine Safety and Health Administration, optional. Must be specified at time of order. Electrical Connection: Shown: 3 m (10'), 2-conductor, PVC insulated cable. Also available: PTIH-10-6P connector. Mating connector (not included) PT06F-10-6S. Units with FM option do not have external zero or span. 4 Digit Indicator with 24 Vdc excitation for pressure transmitter, 230 VAC supply. 6 Digit Indicator with 24 Vdc excitation for pressure transmitter, 230 VAC supply.